My name is Sue Brazier, I qualified in June 1998 at The College of Osteopaths. I worked in osteopathic practices in Cambridgeshire and Lincolnshire before moving to Worcestershire at the end of 1998. I worked at The South Bank Hospital for a couple of years before opening the clinic in Callow End in 2002. I went to an Osteopath in my 20’s and the treatment helped alleviate my pain, I wanted to know more about Osteopathy but it took a few more years before I was able to attend college and learn the art of Osteopathy. Osteopathy includes Cranial and Structural assessment and treatment. I also attended a course in Acupuncture, which is another therapy to use alongside Osteopathy. When you first attend the clinic we take a very thorough case history, asking you questions about your general health as well as your reason for attending. We may ask you to undress to your underwear so that we can see your spine and assess movement and the spines curvature. We will talk you through how we progress, treatment, exercises and self help. If we need to refer you on to another health professional we will discuss why and help with that referral. The clinic has an excellent massage therapist, Simon Griffiths. Regular massage ensures that small injuries are treated before they reduce sporting performance and stiff, tight muscles treated before compensatory mechanisms take place. 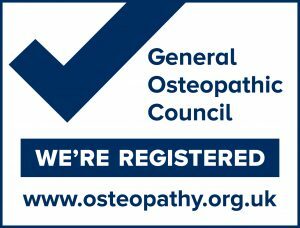 Our Osteopaths are registered with the General Osteopathic Council (GOsC). Osteopaths are required to renew their registration every year and the GOsC provides our licence to practice. As part of this process the GOsC checks that osteopaths have current professional indemnity insurance, remain in good health and of good character, and have met mandatory continuing professional development requirements. It is against the law for anyone to call themselves an osteopath unless they are registered with the GOsC. We can also be found on the Institute of Osteopathy website.